In this travelogue of self-discovery, Jane Christmas brings her wickedly irreverent style to a new mother-daughter experience. Since the beginning of time, mothers and daughters have had notoriously fraught relationships. "Show me a mother who says she has a good or great relationship with her daughter," Jane Christmas writes, "and I'll show you a daughter who is in therapy trying to understand how it all went so horribly wrong." 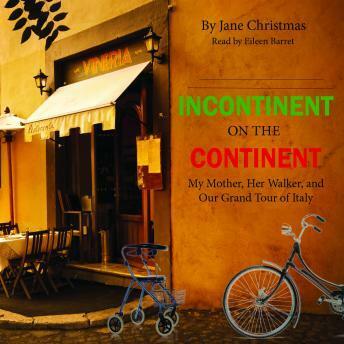 To smooth over five decades of constant clashing, Christmas takes her arthritic, incontinent, and domineering mother, Valeria - a cross between Queen Victoria and Hyacinth Bucket of the British comedy Keeping Up Appearances - on a tour of Italy. Neither has been to Italy before, but both are fans of ancient art, architecture, and history. Will gazing at the fruits of the Italian Renaissance be enough to spark a renaissance in their relationship? As they wander along the winding Amalfi Coast, traverse St. Peter's Square in Rome, and sample the wines of Tuscany - walkers, biscuits, shawls, and medications in tow - they revisit the bickering and bitterness of years past and reassess who they are and how they might reconcile their differences. Unflinching and frequently hilarious, Incontinent on the Continent will speak to all women who have tried to make friends with their mothers. "Her style is equal parts Nora Ephron and Bill Bryson." - Quill and Quire. It made me laugh at least 15 times.At the end I cried. It made me want to be a better Mother. Nurture. Let go of resentment. I do not have a daughter, I have Sons. We are all missing out. I am the Daughter. This Mom was a combination of my Mother and Father physically right now. I am 61, I know my Mother loves me and I love her. She pushes me away a lot . Thank you for this book.